Categories: Best Sellers, Fragrant, Introductions, Most Popular. Named in honor of our local University of Tennessee Volunteers, this big orange flower is complemented by superb dark blue-green foliage. A must for all Big Orange fans! I put this beautiful day lily front and center of the garden because it is so gorgeous. Lots of blooms! The Orange Vols plant is entering it’s 4th year in my garden, and every season, I like it more. The color is very showy, and the plant is sturdy and attractive. Great color, blooms prolifically, nice and tall, & multiplies well. My Orange Vols were just gorgeous this year even in the late afternoon when the sun had tried to fry them all day in our very hot weather! They are planted in my backyard & I think I am going to have to plant some in front of the house (a yellow house with white trim). 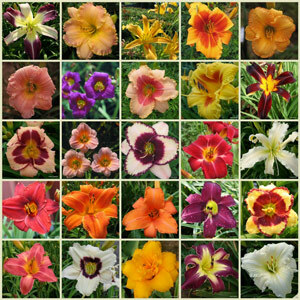 My neighbors have told me they are so glad I am growing flowers (69 varieties of day lilies) in my backyard. They are quite happy to let me do the work & just enjoy the show!! I thought Mary Todd was one of the best varieties until I planted this one. I only ordered 1 plant but it was so huge I was able to get three plants from it which I potted in a 20″ pot in the fall. By June it had busted into lush green foilage with huge, vibrant orange (almost glowing) dozens of blooms. As one of the others said “breath taking” which I attest.Truly this one is at the top of my list. The color remains even through the heat of Georgia 95 degree temps.You won’t go wrong with this one. Wow is the only word that comes to mind.This is a beautiful bright orange,really grabs your attention only wish it were taller .Love it!! Mine were just gorgeous. 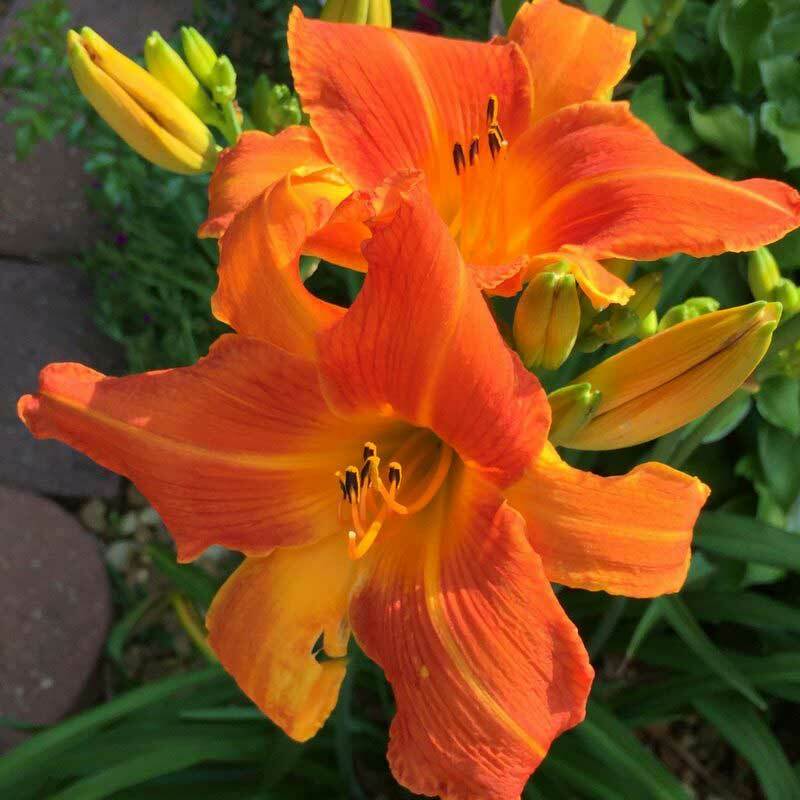 Just the best orange daylilies. I ordered three of these plants in early spring and I’m coming back for more. Absolutely beautiful! 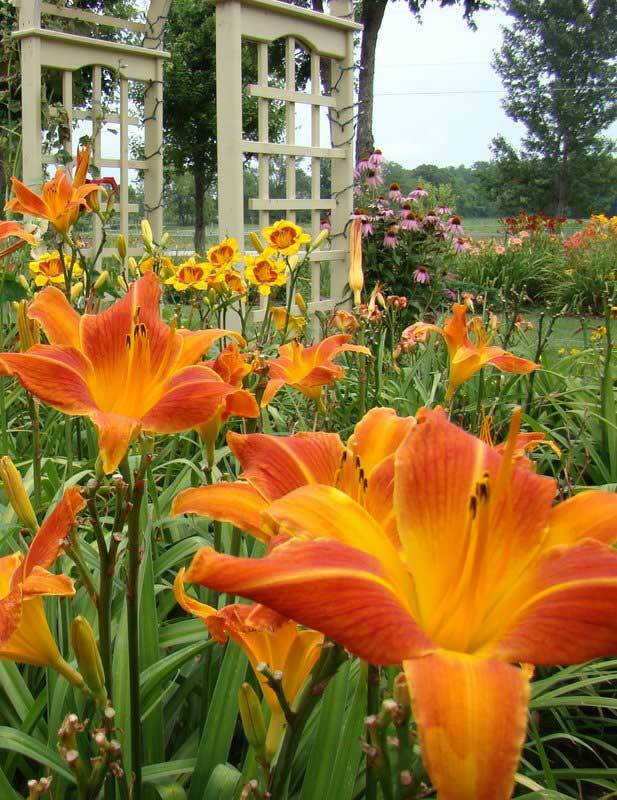 I must admit that I’ve never given daylilies much thought, but Orange Vols has changed my mind. For anyone who loves orange in the garden, these are a must have. I ordered a couple of Orange Vols a few years ago. They bloomed last year, but THIS year they’ve been truly impressive! Both plants are blooming like gangbusters, with a very vivid, intense color, and lots of large blooms on a single plant each day. They are especially lovely in contrast with my blue hydrangeas. I’m not usually an orange-lover, but these are just spectacular. I find they look their absolute best on a cloudy afternoon or in light shade, as you can lose some of the the color nuance in bright sunlight. It is a mesmerizing plant! I agree with the other reviews-this one is fabulous. Warning: the blooms will be hard to stop staring at! THIS IS MY FIRST YEAR WITH OAKS LILIES. EACH ONE HAS BEEN A BEAUTY, BUT THE ORANGE VOLS IS A DOUBLE PLUS. IT JUST STANDS OUT AND DEMANDS YOUR ATTENTION. I AM THRILLED WITH IT’S BEAUTY. I WILL BE ORDERING MANY MORE. 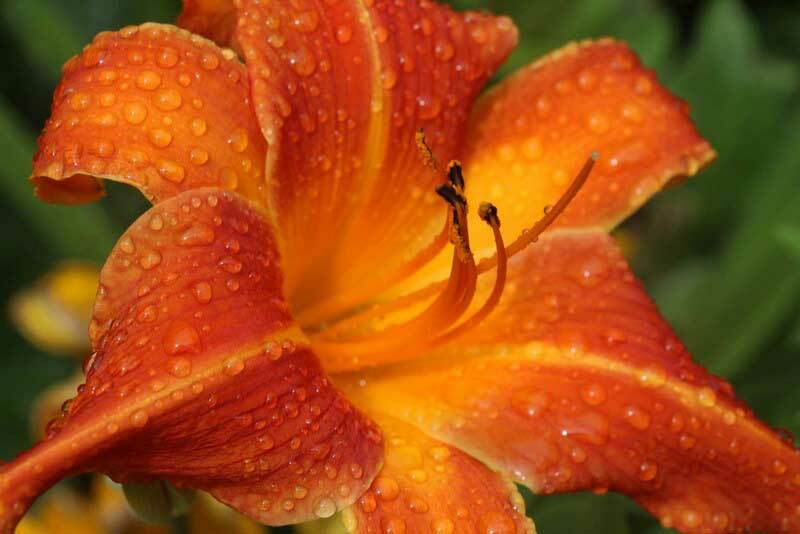 My, Oh My……What a Fantastic daylily. The Orange Vols is a sure standout in the garden. It towers over alot of the other lilies. Just remarkable color. 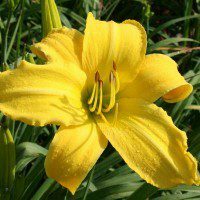 I truly am delighted in this daylily; and will surely order more. To me the orange is just beautiful. Either standing alone or mixed with other daylily colors. I cannot say enough about the Orange Vol. It must be awarded a 10+++…. Great gooly-moogly! The three Orange Vols I ordered have been in the ground exactly 20 days and I already have 13 budded scapes showing. Forgive the “early review” but I had to comment that the time from planting to budded plants must be something of a record! 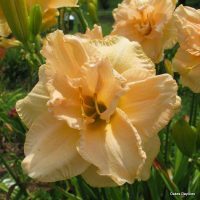 A real testament to the quality material you get from Oakes Daylilies. I got this flower because my husband’s grandmother was a Tennesse fan. The flower is gorgeous. Bright, intense orange, almost a red-orange. I split one of the fans and have 2 plants blooming where I should have had 1. The other nice thing about this plant is that the day-old blooms that are done close up and look very similar to the buds that are about to bloom. So the plant always has a neat appearance, even if you don’t get the chance to clean up the spent blooms. Plus, I love orange flowers, so this one is great for me. This is the second season for Orange Vols in our garden. I’d give it a 12 rating if I could. You can spot this two-tone large flower for a long way off. It is so hot and dry here but the Vols are blooming like conditions are perfect. Hopefully, we will get some rain soon and can look forward to rebloom also. Watering with city water just doesn’t do as well as rain or well water, IMO. No ditch lily look here. 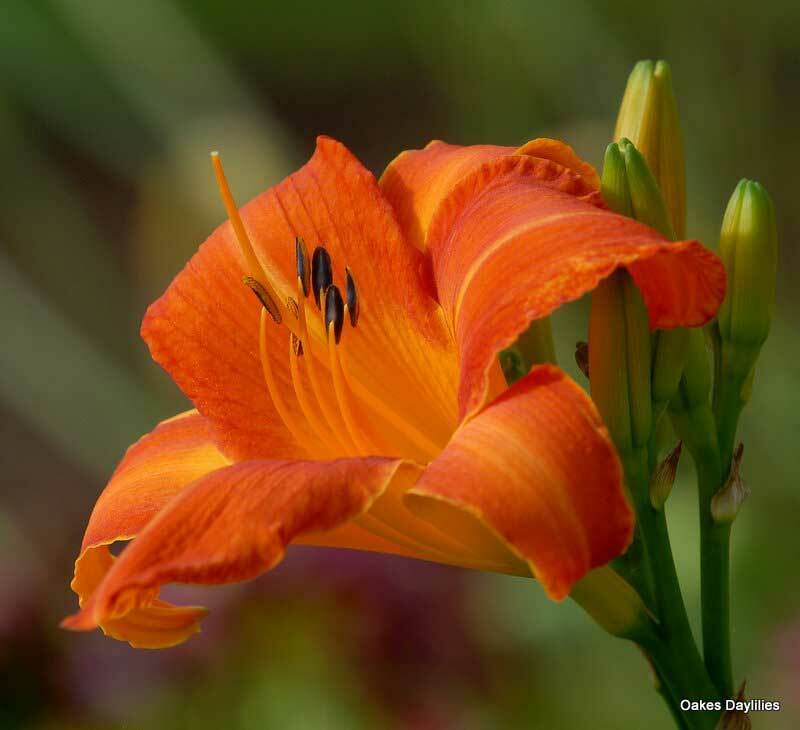 If you are an orange daylily fan, get yourself some Orange Vols from Oakes, and get ready for beautiful blooms. The color glows. It is so much more beautiful than the photo shows. It clumps right up and has a large number of flowers for a longish season. I love it. I’ve had this one for 3 years now and it’s always a showstopper. The best daylily I’ve ever had. Large scapes and prolific flowers – the best. 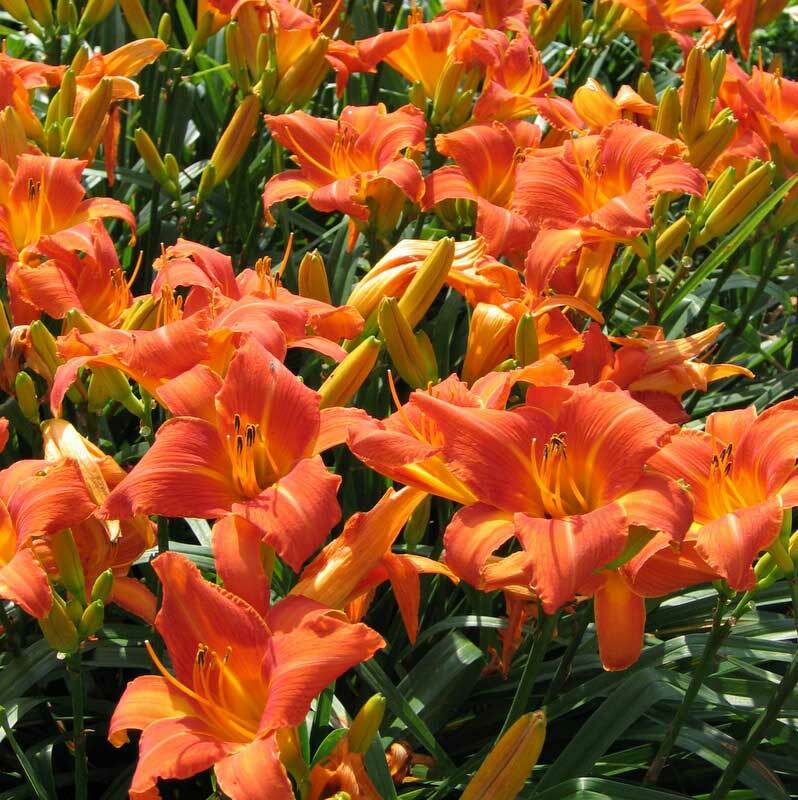 I have many of the Returns variety but the large lilies of Orange Vols blown them away. I love Orange Vols. It is a showstopper. The scapes get much taller than 24″ so it’s blooms are above the foliage. Can’t wait to divide this and spread it around my garden. 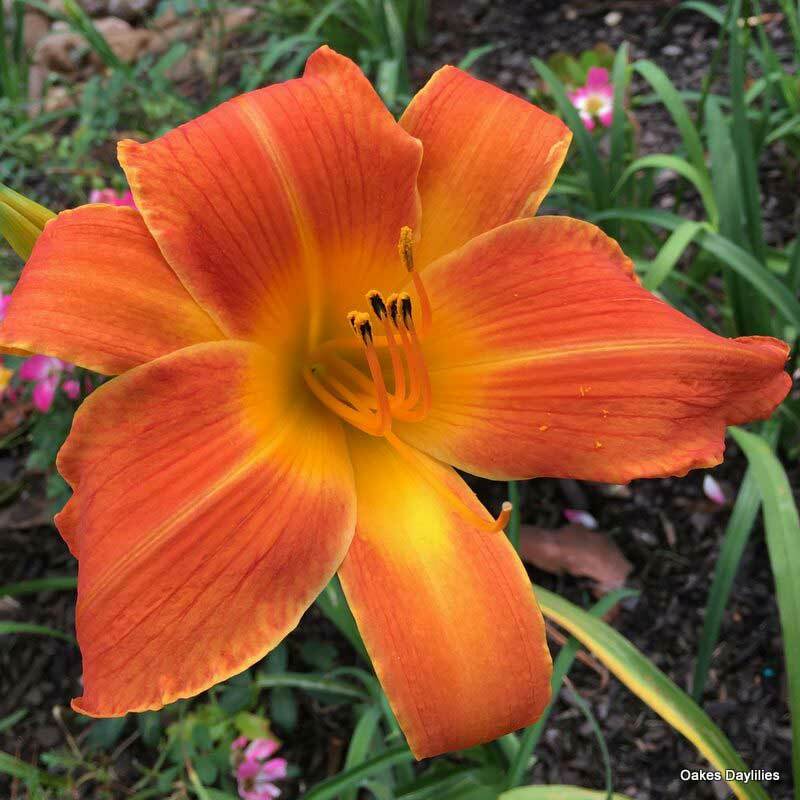 Just this year, finally gave in and ordered this spectacular daylily, since orange reminds me so much of the older ‘ditchline daylily’ with which I grew up. Wow! 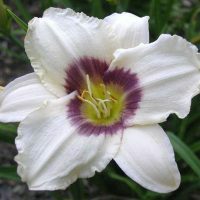 Even in this first year in our garden, it bloomed prolifically and was totally eye-catching and visitors always had a comment on this particular daylily. Why did I wait so long? 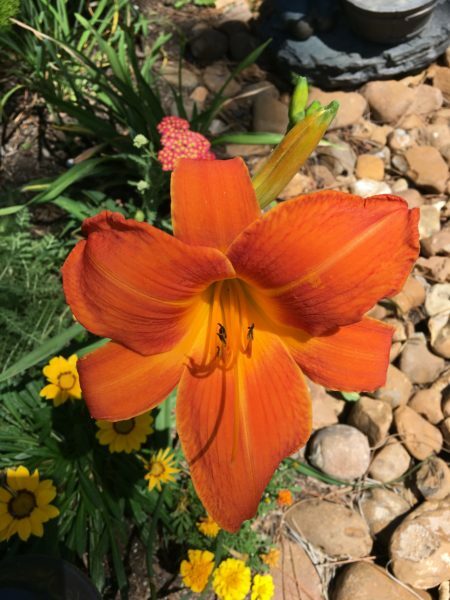 I planted several Orange Vols this spring based on the glowing reviews by other customers, and they are without a doubt the best daylilies I have ever seen. The color is a magnificent bright orange that lights up the whole garden. The flowers are abundant and longlasting, and the foliage is dark green and vigorous. 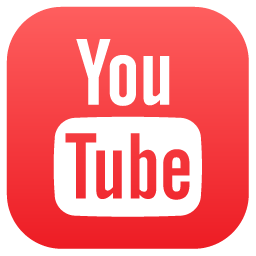 Keep in mind that this was the FIRST year–just imagine how great they’ll be next year. 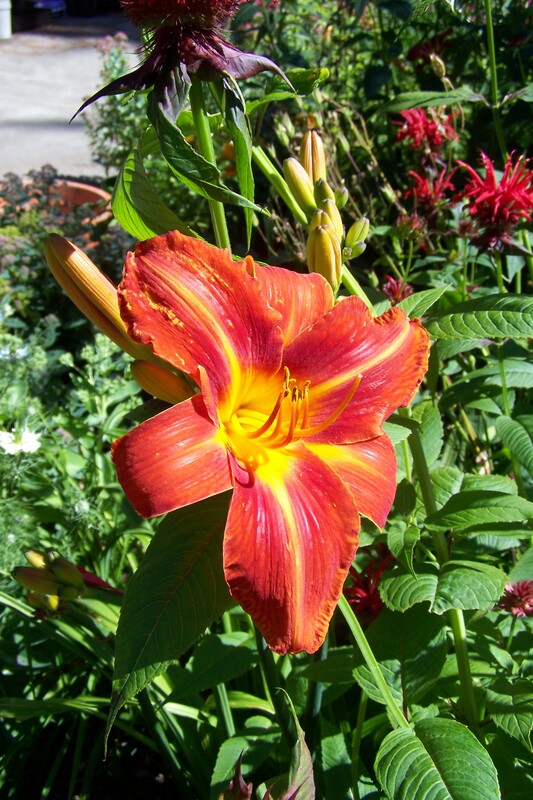 Orange Vols is such a wonderful daylily that I planted 11 more in early July! My Orange Vols is just beginning to bloom and it is absolutely georgous!! It has the most vivid color and the plants are covered in buds ready for blooming. I can’t say enough…the blooms are huge. Our soil is terrible here, but these plants appears so healthy! Orange Vols is a wonderful vibrant color and has many blooms.I have had this plant for 2 years and it has done great. What can I say about Orange Vols. Unbelievable first year performer! It just outclasses them all. Loads of buds and beauty. I thought there might be a bias with the Tennessee connection. What bias, this flower is a must for any fan. If I could rate it a 100 I would. Planted this spring, this one is already blooming with its huge bright bold orange flowers! Love it! This is the first year for mine in an established bed. I had to move them last year so no blooms. The color is AMAZING! I love orange, and the orange on this one is unique and very pleasing. Blooms have a very sturdy substance, and look strong. I can’t wait for them to fill in. I love my “Orange Vols”. I can’t help but smile when it’s in bloom. I’ve had mine for 4 years and am very happy with how it has adapted to our cold windy in winter and hot windy in summer area. Excellent bloomer here in South Carolina. Long bloom season, and great size and color. 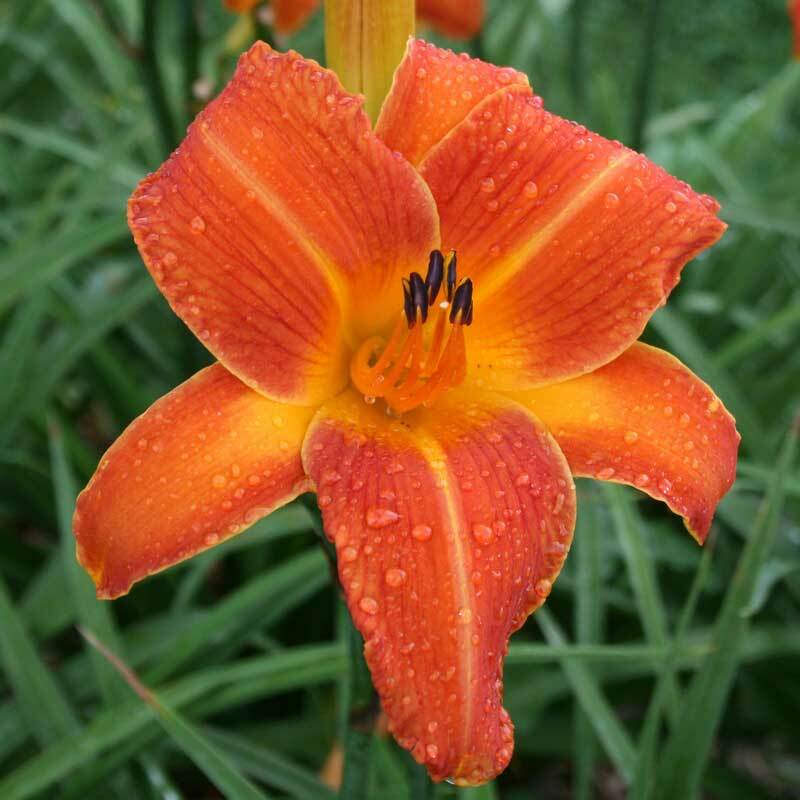 Maybe the best orange daylily we have seen. I received this as my bonus lily and thought “Darn, not another roadside orange daylily” but oh what a surprise. It is huge and simply glows – almost royal. You know how to pick a winner – thanks. If you want a splash of color that people can’t keep their eyes off of this is the one. It is striking and intriguing. Fits nicely in the landscape. Can’t go wrong with this one! Planted three orange vol plants in mid May 2006 and have had the first blooms on one plant in early July. Very eyecatching with large vibrant deep orange blooms and nice looking foliage. This is my favorite so far of all my new daylilies. My Orange vols opened today for the first time. And this is the most beautiful daylily I have set eyes on up till now. The flower are huge and vibrant. Mine are more of an orange than the picture, with the yellow standing out. I planted mine middle May this year and it made it’s first scapes after a month. It has already 3 scapes. 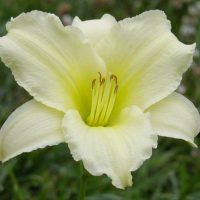 I have received a nice big plant from Oakes Daylilies. 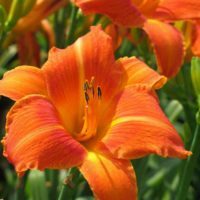 If you like orange and can only buy one orange daylily, then this is definitely the daylily to buy. Oh my gosh! I couldn’t take my eyes off this beauty. Planted in March, and it bloomed prolifically for several weeks this summer. The orange color is deep and vibrant and very visible from a distance. 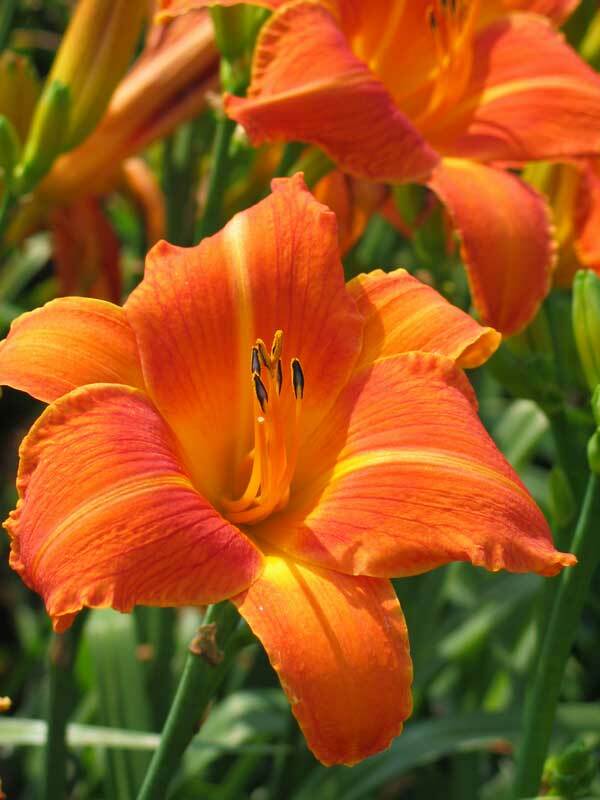 Orange Vols is a very beautiful two-toned orange daylily that will stand out in any garden. I have three of them in a garden that gets the hot afternoon sun and have no problems with them. I look forward to seeing their blooms every year. The blooms are very eye-catching. 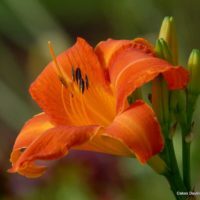 Orange Vols is one of the best orange daylilies in my opinion. We planted these on April and had huge bloom covered plants by the end of June and they are still going strong by the middle of July. The flowers are huge and almost like super-sized spiders. 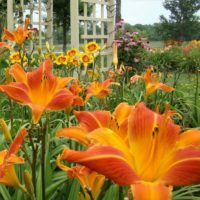 I had seen these in person in the Oakes gardens and the color that I remember and what grew out in MD are much lighter orange than shown above. VERY showy! This is an awesome orange, not like the common orange you find along the side of the road. The flowers are huge & vibrant. I have a circular garden in the middle of my lawn and these just make the most striking display. If you need an area to stand out, plant some Orange Vols. Beautiful, striking flower. In my garden, it looks exactly like the picture here. Be sure to order this one if you like orange. I planted Orange Vols three years ago and it’s a pleasure to see its beauty every year. It’s a prolific bloomer and holds up well in the heat. It rebloomed the second year, but not the third year. I hope it reblooms this year. A very beautiful flower that I’ve photograghed many times over as each seems to be slightly different from the next. A stout plant. I bought this daylily from Oakes last fall. This is the first spring that I have seen this daylily bloom and it was a beautiful! 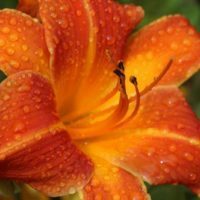 I am a new-to-daylily gardening and I Love It! A dear friend gave me the Orange Vols and it has been such a glorious sight in my new daylily bed. The blooms have been spectacular. I plan to buy this lily for another friend. I planted this daylily this year along with many others and it was the first to bloom. It has beautiful orange flowers with gold highlights. I’m very happy to have it in my garden.